This game is NOT in gamebase! If anybody has a copy (either the English or the French version), we'd appreciate if he contacts us! Also check out this missing game's entry in the Forever Lost? section. 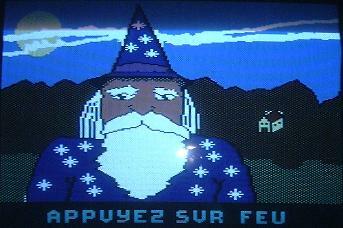 Follow me unto Phalsberg, fellow Wizardlings, as we check out the latest French numerette from Infogrames / Ere Informatique. And sing along with our nostalgic look at another role playing game -- The Bard's Tale. 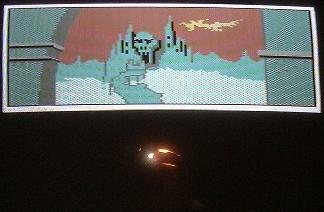 Goggle at the C64 graphics for Knight Orc, wonder at the long list of tips, and . . . get reading! Phalsberg is a role-playing game in which you create a character whose future is determined both by your own decisions during the game and also by the character's skills. 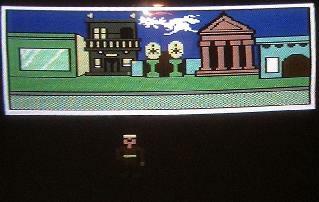 The gameplay involves a lot of tally-hoing across the countryside in search of treasure, monsters, and all manner of mayhem. In most RPGs, skills are set at the beginning of the game by a throw of dice, and Phalsberg is no exception -- a list of skills (see below) is flashed on the screen and you then have a chance to 'throw' for high scores in each skill category. Because a character's skills are incredibly important during a game like this, it's good to see that Phalsberg provides not only a good selection of skill ratings, but also a means of concentrating on certain categories. The program adds bonus points to the marks gained by throwing the dice according to the order of selection, with higher marks being awarded to the categories you throw for first. What this means is that, for example, you may wish to achieve as high a 'Strength' rating as possible for your character and, by choosing to throw for this category first, you stand a better chance. Once you've assigned skill ratings to your character, you give it a Name, a Race (Human, Dwarf or Elf) and, if the character is Human, a Profession. There are four professions (or 'Casts' as the program calls them) -- Thief, Warrior, Magician and Cleric. Each Cast requires a particular balance of skills, so for example a character can only become a Thief if his dexterity rating exceeds 11 points. At this point the significance of being able to throw for extra points for a certain skill becomes obvious. Energy and Charisma are determined by the product or sum of the two previous skills. Each skill plays a certain role in the game -- for example, Charisma influences the outcome of encounters with other characters, while Intelligence dictates how many languages you can speak and therefore how many characters you can talk to. Experience points play a special role -- you can use tem to 'top up' any other skill rating which you may consider to be dangerously low. You accumulate more experience points during the game as you win battles and overcome obstacles. Once you've created your character, you SAVE it onto a preformatted disc. Make sure you've got one before you start, as the program won't let you play without one. This disc keeps track of your character, enabling you o SAVE it for another day -- very important in RPG's where you may spend a lot of time and effort building up a character, particularly its 'Experience Points'. IN PLAY . . . 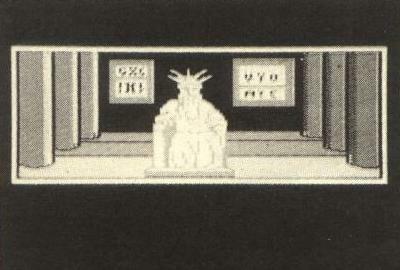 The game loads with a pleasantly programmed rendition of Pictures at an Exhibition. Once you've created your character, however, the . . . er . . . well, let's face it, the problems start. Problem number one is the appearance of the display. Once again, as with Mandragore and a host of other quasi-RPG's, we have a clumsily designed alternative character set trying to present a series of graphic symbols that convey location information. Well, it can be argued that we've come to expect this sort of display -- after all, we've seen it in some of the Ultima games, so it should be good enough for Infogrames and good enough for us. Trouble is, when you combine that text-based graphics screen with an atrociously formatted text window underneath, the display begins to look very untidy. The Wiz doesn't like messy screens, not if he's going to have to look at them for a long time. Today's software should be able to do better than this. PLUS DE PROBLEMETTES . . . But even at this point, I hear you cry, the game should not be beyond redemption. Pretty it may not be, but how doth it play? At this point, we encounter problemette numero deux. This is la problemette de la traduction, or - ahem - a slight probby about the old translation, okay yah? The translation problems occur in two ways and both affect the gameplay. 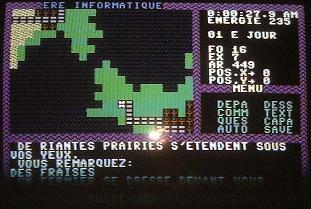 First, the manual is unclear in points and mentions commands (such as Hunt) that do not appear in the program. Since you meet many 'Huntable' creatures, this omission was baffling and frustrating. Also, there are commands that differ in the manual to the way they appear in the program -- the manual says 'Heal', the program expects 'Treat'. You have to exercise the old grey matter to work these things out. Secondly, the screen display itself is not always very clear. If you look at the screenshot, you can see that there is a small batch of abbreviated commands (see below for further details) starting, top right with Star. This is short for 'Start', which the manual says means 'Leave' -- you and I would normally say 'Move'. Not very clear. The display also boasts some very awkward messages, such as 'You Are Carrying: Any' (any what??) and often refers to objects that simply cannot be found or examined. 'A Goblin appears before you, he is carrying a purse' declares the program excitedly. Sweating with exhilaration, you waggle your joystick and select 'Atta' (for Attack) and then 'Gobl' (for Goblin). You succeed brilliantly, the Goblin is dead, the Goblin has disappeared, and . . . ooops . . . so has the purse. How frustrating! These, however, are still little niggles, aren't they? I mean, the game may be a bit on the annoying side, but there's a lot to it and we should be able to put up with its funny little habits. Unfortunately, there are worse problems . . . 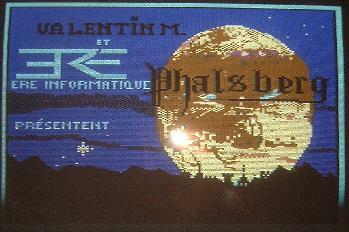 The game is played using a system of menus controlled by the joystick. Each turn you select one of six menu headings. These are Star, Draw, Orde, Text, Ques, Powe, Auto and Save. Star, as we've already mentioned, puts you on the road from one place to the next. Draw gives you a piccy; Text clears the screen and shows you the last screenful of text messages that would otherwise have been scrolled into oblivion outside the small response window; Ques enables you to question other characters; Powe tells you your status; Auto gives you piccies without having to ask for them with Draw; Save saves. Orde is the one to watch, however. It means 'Enter a Command' and if you select it you receive a further sub-menu with a list of verbs. This list, as I've mentioned, differs slightly from the manual which can be confusing in itself. However, the problems really begin when you select a verb that requires an object, such as Examine. You then get a further sub-sub-menu with a list of sub-sub-sub-menus. Thus you might enter Exam, then select Place from the list and from the final menu select Sanctuary, since you have discovered a sanctuary nearby and would like to Examine it. At this point, the proggy gets very wobbly. For the most part, the responses to your actions are short and uninteresting. In search of excitement, therefore, I selected Enter whilst in a village, and then - on a whim - selected Objects instead of Places; I then selected Berries. The program bravely attempted to enter the Berries, triumphantly displayed SYNTAX ERROR LINE 1234987 (or words to that effect), and then, realising that I had tricked it, went into a sulk that only a reset could cure. Ah well. Us adventurers are positively crying out for a good role playing game. The fact is, whatever the pundits may say, that RPG's are not hard to program. That's why so many apparently mediocre programmers get involved in them and so many excellent programmers seek greater challenges. Now if someone like Mike Singleton were to tackle the RPG problem, I'm sure we'd see something exciting. Phalsberg is superficially complex, offers a large number of well though out features, and completely fails to implement them satisfactorily. Infogrames say that many of the problems I've discussed will be checked out, and it's therefore possible tat a new version may be released. If it is, then I'll let you know -- in the meantime, it may be 'up my street', but I'm afraid I won't be opening the door! Only the black&white screenshot existed in the original review. Screenshots taken by Mr. Fox of Hokuto Force and sent over by Rob Nicoletti were added on 4 Feb 2006.